Transient flow of water on Vesta suggested by gullies and lobate deposits. Vesta is the second most massive asteroid in the asteroid belt, with a mean diameter of 526 km (e.g. Russell et al., 2012). High resolution images from the Dawn Mission have detected curvilinear and linera gully forms and lobate deposits in craters and on steep slopes on its surface (Scully et al., 2015). Image 1: (a) Fonteia crater, which contains linear gullies. (b) Unmapped version and (c) mapped version of linear gullies. White arrows highlight an example linear gully in (b). Linear and curvilinear gullies are geomorphologically dissimilar. The linear gullies (Image 1) are straight, non-intersecting, parallel and do not incise the substrate. They originate at spurs of more competent material. Linear gullies form as the intersection between lobes of homogeneous talus deposits, which are interpreted to form by dry flow of talus material. In contrast, the curvilinear gullies (Image 2) are interconnected, non-linear, sub-dendritic and sub-parallel networks that do incise the substrate. They originate in crater walls and end in lobate deposits near the crater floors. The lobate deposits are incised by networks of curvilinear gullies and cross-cut one another to form bajada-like deposits. The lobate deposits are also commonly covered in pitted terrain, assemblages of coalescing pits interpreted to form via impact-induced degassing of volatiles (Denevi et al., 2012). The curvilinear gullies and lobate deposits on Vesta are morphologically analogous to gullies and lobate deposits formed by debris flows on Earth (e.g. Kumar et al., 2010; Blair, 1999) and Mars (e.g. Johnsson et al., 2014; Schon & Head, 2012; Malin & Edgett, 2000): all share interconnected networks of gullies, which frequently end in cross-cutting lobate deposits that are incised by the gullies (Figure 2). As a result, the curvilinear gullies and lobate deposits are interpreted to form via a debris-flow-like process. Flow of impact melt and dry flow of material were considered as alternate formation mechanisms, but were ruled out on account of morphology, composition, temperature properties, surface slopes, and grain sizes (discussed further in Scully et al., 2015). Image 2: (a) Cornelia crater, which contains curvilinear gullies and lobate deposits. (b) Unmapped version and (c) mapped version of curvilinear gullies and lobate deposits. (d) The short white arrows highlight an example curvilinear gully, and the long white arrows highlight an example lobate deposit. (e) Lobate deposits and incised gullies in Istok crater on Mars (from Johnsson et al., 2014). (f) Lobate deposits and incised gullies in Death Valley on Earth (image from Google Earth; interpretation from Blair, 1999). Curvilinear gullies and lobate deposits are proposed to form when impact-induced meltwater is released onto crater walls, and mobilizes the impact-formed debris into a debris flow, which carves the curvilinear gullies until they end in the deposition of the lobate deposits. The meltwater is proposed to be sourced in sub-surface ice-bearing deposits. Water is unstable on the surface of Vesta because of the very low surface temperatures and pressures. Thus, the water will evaporate during flow, and any water remaining in the lobate deposits will evaporate to form pitted terrain. Laboratory experiments and quantitative modeling support this formation mechanism (discussed further in Scully et al., 2015). Curvilinear gullies and lobate deposits are only observed in relatively young (< 100s Ma old) craters, but may have formed throughout Vesta’s history because they are shallow landforms that would easily be erased by depositional processes. This study, in addition to remote sensing (De Sanctis et al., 2012; McCord et al., 2012; Prettyman et al., 2012; Reddy et al. 2012) and meteorite observations (Sarafian et al., 2013; Warren et al., 2013; Treiman et al., 2004), suggest that Vesta may not be an entirely dry body as was previously assumed. Thus, Vesta, along with other asteroids and main belt comets (e.g. Küppers et al., 2014; Hsieh and Jewitt, 2006), suggest that the solar system may not consist of entirely dry or entirely wet bodies, but may be more accurately characterized by a continuum of bodies with many intermediate states of hydration. De Sanctis, M. Cristina, et al. (2012). Detection of Widespread Hydrated Materials on Vesta by the VIR imaging spectrometer on Board the Dawn Mission. TheAstrophysical Journal Letters, 758, 1-5. Denevi, Brett W., et al. (2012). Pitted Terrain on Vesta and Implications for the Presence of Volatiles. Science, 338, 246-249. Hsieh, Henry H. & Jewitt, D. (2006). A Population of Comets in the Main Asteroid Belt. Science, 312, 561-563. Johnsson, A., et al. (2014). Evidence for very recent melt-water and debris flow activity in gullies in a young mid-latitude crater on Mars. Icarus, 235, 37-54. Kumar, P. Senthil, Head, J. W. & Kring, D. A. (2010). 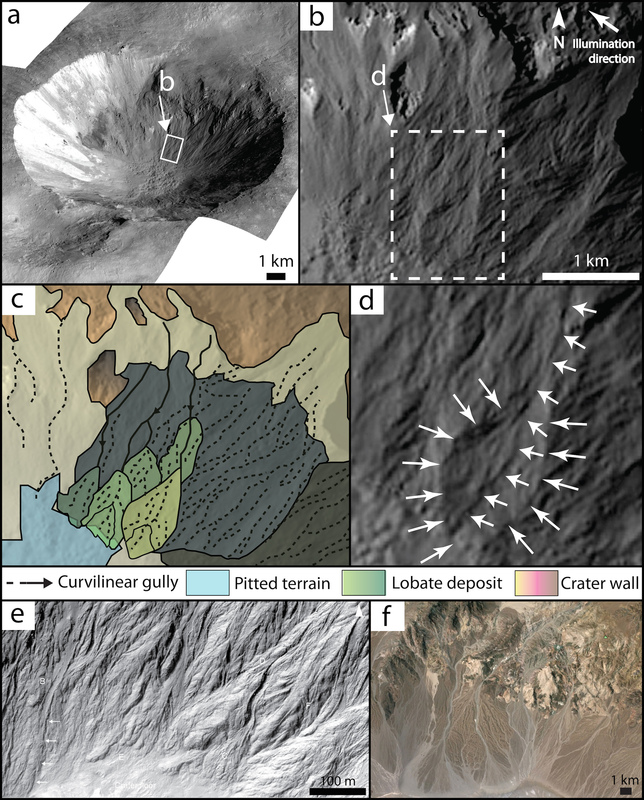 Erosional modification and gully formation at Meteor Crater, Arizona: Insights into crater degradation processes on Mars. Icarus, 208, 608-620. Küppers, Michael, et al. (2014). Localized sources of water vapour on the dwarf planet (1) Ceres. Nature, 505, 525-527. Malin, Michael C. & Edgett, K. S. (2000). Evidence for Recent Groundwater Seepage and Surface Runoff on Mars. Science, 288, 2330-2335. McCord, Thomas .B., et al. (2012). Dark material on Vesta from the infall of carbonaceous volatile-rich material. Nature, 491, 83-86. Prettyman, Thomas H., et al. (2012). Elemental Mapping by Dawn Reveals Exogenic H in Vesta’s Regolith. Science, 338, 242-246. Reddy, Vishnu, et al. (2012). Delivery of dark material to Vesta via carbonaceous chondritic impacts. Icarus, 221, 544-559. Russell, Christopher T., et al. (2012). Dawn at Vesta: Testing the Protoplanetary Paradigm. Science, 336, 684-686. Sarafian, Adam R., Roden, M. F. & Patiño-Douce, A. E. (2013). The volatile content of Vesta: Clues from apatite in eucrites. Meteoritics and Planetary Science, 48(11), 2135-2154. Scully, Jennifer E. C., et al. (2015). Geomorphological evidence for transient water flow on Vesta. Earth and Planetary Science Letters, 411, 151-163. Schon, Samuel C. & Head, J. W. (2012). Gasa impact crater, Mars: Very young gullies formed from impact into latitude-dependent mantle and debris-covered glacier deposits? Icarus, 218, 459-477. Treiman, Allan H., Lanzirotti, A. & Xirouchakis, D. (2004). Ancient water on asteroid 4 Vesta: evidence from a quartz veinlet in the Serra de Mage eucrite meteorite. Earth and Planetary Science Letters, 219, 189-199. Warren, Paul H., Isa, J. & Gessler, N. (2013). Petrology of secondary mineral development, probably fluid-driven, within the uniquely evolved Eucrite Northwest Africa 5739. Lunar Planet. Sci. Conf., 44, 2875.